The Craft of Mimi: Winter mixed media. Happy New Year's everyone! I hope you all had a fabulous and safe celebrations. Oddball Arts host another challenge on the blog: Winter. I created this mixed media page in my handmade album. I really loved working on this page and used variety of mediums. Firstly I used light watered down white gesso to cover some of the sparkles on this silver glitter page. It was really silver and I felt it would take too much from the page. Then I used some blue stain paint from Tim Holtz to add a bit of colour to the background. I used dry kitchen towel to blend it to the background a little. When it dried I added some perfect pearls to give the page some glimmer here and threre. Sprayed with a bit of mist to set it in. 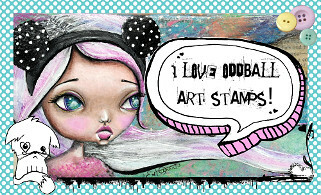 Meanwhile coloured the little digi stamp from Oddball Art using my Letraset Promarkers and used a bit of paint for highlights before cutting her out. After stamping the background with heart background stamp I glued the image on using mod podge covering only back of the picture. Added some bling swirls purchased from Hobbycraft and some liquid perfect pearls from Ranger. I cut out the snowflake templates from my cameo and used modeling paste to finish of the page. Gorgeous card! I really like the sweet image and how beautifully you coloured it! Fabulous background you created! So glad you linked up with us at Glitter n Sparkle for our Anything Goes challenge. Best of luck in our prize draw! Happy New Year! Cute Mixed Media! 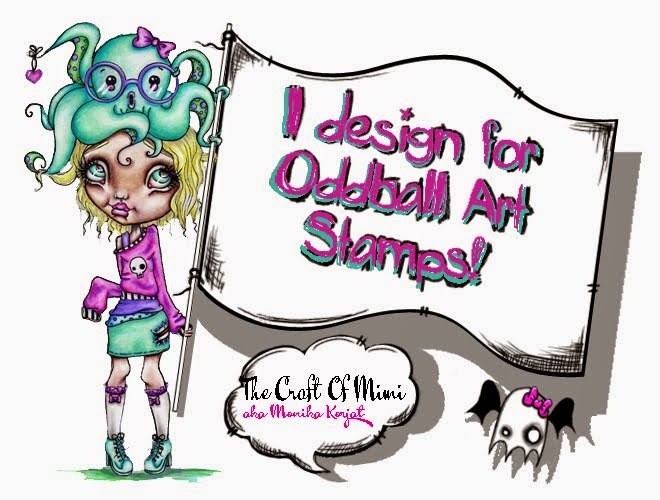 Thanks for linking it up at Little Miss Muffet Stamps.